Sweeping views of terraced rice fields, hues of green and yellow as far as the eye can see, trekking experiences led by local ethnic minority groups, and a quaint hill station town in the mountains of Northern Vietnam - Sa Pa will immerse you in a cultural experience that will change you forever. While planning my trip to Vietnam, I’ll admit that Sa Pa almost didn’t make my itinerary. There is so much to see in Vietnam, and I wondered if Sa Pa was really worth the 9-hour overnight train ride from Hanoi, the capital city of Vietnam. After staring wide-eyed at the cascading rice terraces in pictures online, I decided to make the trip and planned a two-night stay in Sa Pa town as well as a full day trekking tour of the Muong Hoa Valley. In this post, I’ll share with you the highlights of my trip and provide all of the resources to plan your own successful trip to Sa Pa. If you have questions or any tips to add, leave a comment below or contact us at am@twobluepassports.com. 1. Why is Sa Pa worth the trip? Why is Sa Pa worth the trip? Sa Pa is a small hill station town in Northern Vietnam close to the border of China. It’s best known for the terraced rice fields that cover the Muong Hoa Valley which is located between Sa Pa town and Fanispan Mountain, the tallest peak in all of Vietnam. The town is gorgeously picturesque with buildings inspired by French architecture, local tribes selling handmade goods on the streets, and delicious local cuisine. You can also indulge in luxurious, yet affordable, spa treatments and trek through the rice fields with members of the Hmong tribe, an ethnic minority group that makes up about 50% of the local population. Sa Pa is an oasis outside of the bustling cities of Hanoi and Ho Chi Minh City, the two largest cities in Vietnam. I spent over two weeks traveling in Vietnam and while I fell in love the with entire country, Sa Pa was a true highlight of the trip. It’s unlike any place I have been before and I left inspired by the locals I met, feeling that I was expanding my understanding of what life is like in such a drastically different part of the world. As John Steinbeck once said, “people don’t take trips, trips take people.” Sa Pa took me on an adventure I will never forget. Our trekking guides from the Sa Pa Sisters Trekking Group. A foggy morning walk along the street that led to the trail entrance. Sa Pa town is very walkable and worth spending a few hours exploring without having a specific destination. The center of Sa Pa is Quang Troung Square, which houses a local market on weekends and is located next to a beautiful church, the Holy Rosary. There are local shops, cafes and street food pop-ups. We enjoyed walking off the main drag of P. Cau May and exploring the side streets and local architecture. I came across this local organic farm while exploring the side streets of Sa Pa town. Nestled on a small side street, this was my favorite restaurant in Sa Pa town. They serve local Hmong dishes to perfection. We tried the local Brook fish as well as Tao Meo wine, a whisky made from the fruit of the Tao Meo tree that grows in the mountains. The fish was delicious, but the wine was a bit strong for my taste. The name is a bit misleading, as there is no view to this restaurant, but the food is incredible. I had the most delicious banana flower salad, spring rolls, and main dishes. The prices are great and there is even a book store where you can purchase books at a low price or trade in books you’ve already finished on the trip. The Why Not Bar is probably your best bet for a night out. There are only a couple of bars in the small town of Sa Pa and Why Not has affordable drinks and a pool table. A tiny bar with wooden decor, this oasis serves an incredible hot red wine with cinnamon. It's the perfect palace to stop for a drink after a long day of trekking. The Hill Station puts on a highly-rated cooking class in Sa Pa that includes a market tour to buy all of the local ingredients. I was strapped for time and unfortunately couldn’t experience this, but it’s at the top of my list for when I have the chance to return to Sa Pa.
Local children playing on a rural street in Sa Pa. The fog rolling in over the Sa Pa Valley. One of our H'mong tour guides enjoying the trek. I've experienced some of the best massages of my life during trips to Southeast Asia, but the best spa experience by far was at the Victoria Sapa Resort and Spa. On my last day, I checked out of the hotel and spent the day lounging by the indoor pool sipping green tea. It was the perfect way to relax before heading back to Láo Cai for the night train home. I highly recommend treating yourself to one of their services. The H'mong tribe uses the natural dye of these indigo plants to color their clothing and fabrics. Take a night train from Hanoi to Lao Cai station near Sa Pa. We went through Sapaly and arrived safely in about 9 hours. You'll need to take a bus or taxi from the train station to your accommodation. Some hotels will set this up for you so plan ahead for this if possible. 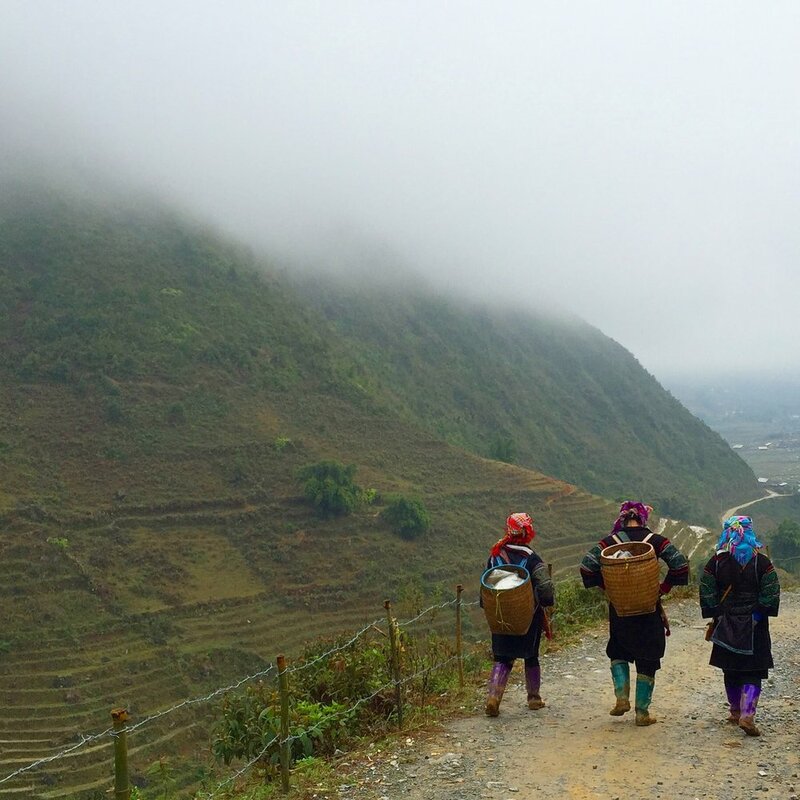 Once in Sa Pa, you can walk pretty much anywhere. Looking out over the valley from town. I was not able to experience a Homestay during my trip to Sa Pa, but highly recommend planning a 2-day trek that includes this experience if you have the chance. I have heard rave reviews from friends and hope to include this in my next trip to Sa Pa.
A fairly low cost hotel in a good location in town. I stayed here and the experience was overall positive with gorgeous views if your room overlooks the terraced rice fields. If I come again, I plan to trek for more than one day and experience a Homestay. The Chau Long Sapa Hotel is a great option to stay overnight in town. Beautiful architecture outside, great location, and nice views of the mountain. Rated in the top ten of Sapa hotels, the location is great, but it can be noisy due to the centralized location. By far the most luxurious hotel in Sa Pa, the Victoria Hotel and Spa is located at the top of town. We didn’t say here, but we did book spa services and spent our last day pampering ourselves before taking the night train back to Hanoi. A luxury massage and day in the sauna cost only about $50 USD. The Hill Station is a chain of services (hotel, restaurants, cooking class) of very high quality in Sa Pa. If the hotel is anything compared to the signature restaurant, it’s worth the cost of about $80 USD a night. A good option with views overlooking Fanispan Mountain. > You’ll most likely need a travel visa for Vietnam. Make sure to check with your local government to plan ahead for this. If you're also a U.S. Citizen, you can check out this website to learn how to get your Vietnam visa. > About a month before you leave, visit a travel doctor/clinic so they can prepare you with any necessary medication and vaccinations. > Many of the locals stand on the street and repeat "You buy?" as they present souvenirs, scarfs, bracelets, etc to you. There are even young children that will ask you to purchase items from them. The best thing to do is say no politely and continue walking if you don't have intentions of purchasing anything from them. > If you do buy fabric items from the H'mong tribe such as scarfs or tapestries, be careful not to let it have direct contact with your clothes. The indigo dye that is used to color the fabric will run until it is washed a few times. > Sa Pa can be significantly colder than the more Southern parts of Vietnam, including Hanoi. Luckily, there are a number stores that carry affordable winter and rain clothing, including many knock-off Northface shops. > For trekking, you can rent hiking shoes or rubber boots from the trekking company or the stores on the main road. These ducks are blue due to the indigo that the H'mong tribe uses to dye their clothing and tapestries. I quoted so many Billy Madison lines while taking this picture. "I've always wanted to see a blue duck." "That's Quacktastic"
Thanks for reading! I hope this post will help you plan your own Sa Pa adventure. Have you been to Sa Pa before? Do you have any tips to add? Leave a comment below!